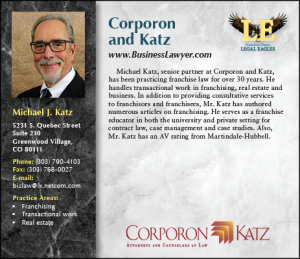 Corporon & Katz is a business lawyer specializing in franchise, business, and real estate law located in Denver, Colorado and serving clients in the Denver Metro area and across the United States, Canada, and, Australia. With over 75 years of combined law practice and trial experience as a business lawyer, the firm delivers expertise and excellence. Taking advantage of a centralized location and low overhead, Corporon & Katz is able to offer their clients high-level, sophisticated services at reasonable rates. 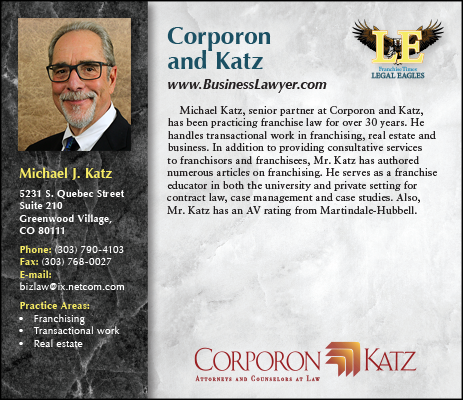 As a business lawyer, Mr. Katz has years of experience serving as a Denver franchise lawyer, who is a Certified Franchise Executive (a certification granted by the International Franchise Association the world’s largest franchise industry group), works with franchisor clients on the development, structure, and eventual registration of the franchise offerings thereby providing a comprehensive and proven process to facilitate the operation of the entire franchise system. In collaboration with the client, he will write the federally mandated “Franchise Disclosure Document” (FDD) in clear, concise and easily understood language. Franchisor clients will also benefit from our franchise attorney’s business, transactional, and real estate expertise since franchising is so intertwined with each discipline. As an experienced business lawyer in Denver, Mr. Katz is a member of the Colorado Association of Business Intermediaries and can handle all aspects of corporate and business formation, contract law, structuring and reorganization, and the drafting and negotiating corporate and business contracts. The firm provides the right combination of legal expertise, business intelligence, astute counsel, and strategic thinking. In many cases, the decision to purchase a franchise will be the largest cash expenditure a person will make after the purchase of a home. It is a life-changing decision. The Federal Trade Commission (FTC) requires that a franchisor deliver the FDD to a prospective franchisee at least 14 calendar days before he or she pays any money or signs the franchise agreement. During this due diligence period, our Denver franchise lawyer helps the prospective franchisee understand the document (which can be 150 pages or more) and, as importantly, the relationship that is created by it. Our Denver franchise attorneys help the prospect navigate through the legal, ethical and practical framework within which any franchise opportunity must operate so that he or she can make an informed and knowledgeable business decision. Real estate transactions often contain a variety of complex issues that make each transaction a unique challenge and the smart consumer employs the help of an expert Denver real estate lawyer. 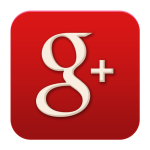 Mr. Katz who has been a licensed real estate broker since 1982, advises his clients in acquisitions, sales, financing, and development of both commercial and residential properties. He understands that there are no “boilerplate” solutions, and carefully analyzes the multiple aspects of each deal in the best interests of the client. 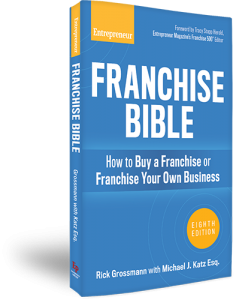 Michael J. Katz, Esq., is the co-author of “The Franchise Bible” published by Entrepreneur press. In this easy-to-read guide, franchise expert Rick Grossmann and franchise attorney Michael J. Katz impart decades-worth of insight and advice on what it takes to make your franchise operation successful. Grossmann and Katz share expert tutorials, tricks of the trade, and access to sample franchise documents, checklists, and questionnaires designed to get you organized, support you through the process and get your new franchise off the ground.